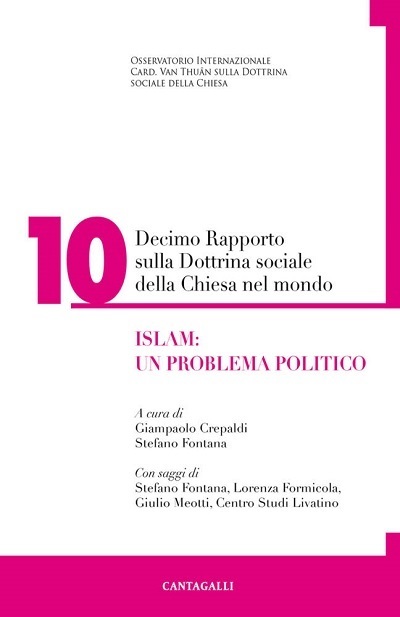 On Monday 14 January, the Italian daily newspaper, ‘La Verità’, published an article by Lorenzo Bertocchi on the X Report on the Social Doctrine of the Church by the Observatory Cardinal Van Thuân, entitled “Islam, a political issue’. In that article, this journalist also referred to previous Reports, and the one on Migration in particular. 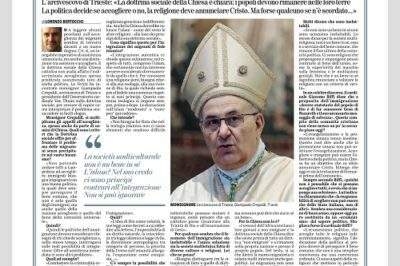 Presented below is the full text of the interview with Archbishop Giampaolo Crepaldi, bishop of Trieste and President of our Observatory, published on the same page with the article in question. Ever increasing are appeals for open receptivity, often on the part of clerics and representatives of the Church’s hierarchy. What criteria does the Social Doctrine offer in order to deal with the issue of immigration without falling into a void sense of good feelings? One of the privileged ways for the exercise of charity is politics. This also requires the use of reason in order not to be limited to personal endeavors of solidarity, but strive to construct a supportive society that would work in such a manner. Since not everyone can go to Lampedusa to welcome immigrants, it is necessary to put into practice a good policy that must always pursue the common good, which is not only that of the immigrants themselves, but also that of the host nation and the good of the universal community. Therefore, immigration policies must consider the needs of those requesting reception, and at the same time ponder the real possibilities of integration above and beyond immediate assistance and other problems, such as the fight against the organized crime circuits that organize the landings, the deterrence of collusion with some NGOs, and not offload all the responsibility on Italy, but foster European and Mediterranean collaboration, etc. Personal charity often propels hearts over obstacles, but politics must regulate reception in a structured way, safeguarding the good of one and all. According to the your Observatory’s recent X Report, the issue of the relationship with Islam clearly assumes striking political relevance, and hence must be judged also according to the principles of the Church’s social teaching. What does this mean for the integration of Muslim migrants? When dealing with religions, politics must first of all know the religions it is dealing with, and shy away from the propensity to consider them all the same or all different. In other words, it must confront the truth of religions, otherwise it would not exercise its own political rationality. This is something politics must do with respect to Islam. In a certain sense, this is also a task for the Church which should not limit itself to inter-religious dialogue or sermons about generic and undifferentiated reception. The Church as well should assess Islam – just like all other religions – according to the principles of its social teaching.. This sort of evaluation is a requisite for authentic integration in respect for all, including Islam which certainly harbors no interest in being considered as anything other than what it is. In order to know a religion, however, it is necessary to delve into its theology, its vision of God, and this always means that believers have to be consistent with their own principles. Sooner or later this theological consistency always assumes the upper hand, and this is where any discussion about “moderate” or “European” Islam falls by the wayside. This is the reason why it is necessary to avoid pretending that Islamic theology does not include elements that make integration difficult. Here are a few of them: the idea of God as Will, His laws as decrees to be obeyed by the letter of the law, the impossibility of a natural law, the correspondence of Islamic law and civil law, the anthropological distinction between categories of persons, the priority of the Umma over humanity at large, expansion as conquest. Being under the illusion that these characteristics can change is tantamount to being naïve. It would be like thinking a Catholic could give up believing in the Triune God and the incarnation of Jesus. It seems to some people that the phenomenon of immigration is unavoidable, and the only solution is the multi-ethnic society made up of diverse cultures and religions. What’s your opinion about that? It is necessary to distinguish between de facto e de iure situations. It may well be that migration and immigration will continue in fact, but no one can say this is a good in itself. The bishops of Africa call on their young people not to emigrate, and the Social Doctrine of the Church says that pride of place belongs to the right “not to emigrate” and remain in one’s own homeland and with one’s own people. Moreover, it is well known that hidden under the cover of the migratory tsunami are many forms of interest, geopolitical ones as well. Migration is therefore not a good in itself – this depends on whether it serves the good of man or not – and if it is not a good in its own right, it is not unavoidable, even if de facto judgment seems to tell us that is how things stand today. The same applies for the multi-religious society. It is not a good in itself and remains at the service of the common good, which is the ultimate end and purpose of the political community. There are religions that propose and impose practices contrary to the good of man, such as the superiority of the male over the female, or genital mutilation. To say the multi-religious society is a good in itself means to forego any assessment of religions according to the criterion of truth. In a famous speech delivered 9 days after the attack against the Twin Towers in New York, Cardinal Giacomo Biffi said that as far as immigration was concerned “it is the statutory duty of the people of God and the task of each baptized person to proclaim Jesus of Nazareth, the Son of God who died for us and rose from the dead, and His necessary message of salvation”. Isn’t this task of the Christian community falling somewhat into the background today? Evangelization and human promotion go hand in hand. This also means that that human promotion cannot replace evangelization. Reception and integration can be the aim of politics, but the Church has an aim that goes beyond that: proclaim Christ. Nowadays I feel there is a temptation to stop before proclamation.. Likewise according to Cardinal Biffi, “since it unthinkable to take everyone in, it is obvious that a selection process is required”, and he clearly stated that “the responsibility to select pertains exclusively to Italy, and not others”. This seems like common sense, and yet it now seems to be replaced by “politically’ flavored “ecumenism”. Might Cardinal Biffi have been mistaken? As I said above, the political ecumenism that is open to all religions in an indiscriminate manner means the abdication by politics of its duty to pursue the common good, which is not just ‘cohabitation’, but an ordered ‘cohabitation’. There are aspects of religions that endanger this ordered ‘cohabitation’. Nonetheless, we also have to reverse our line of reasoning: western political reasoning has weakened and by now tolerates everything, striving to conceal this weakness by transforming its religious indifference into a value. As Nietzsche was wont to say, a weak person defends himself by transforming his own misery into a virtue. This is what Europe does when branding its indifference to religions as religious tolerance. Politics must be tolerant, but cannot tolerate evil no matter where it comes from, including from religions. Without prejudice to the dignity of individuals, religious policies must take these differences into account in both receiving and integrating, and can never just lump everything together.